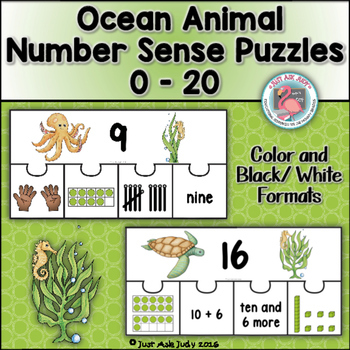 This number sense activity with an ocean animal theme includes page size color and black/ white puzzles with the numbers 0-20 represented in different ways- number words (0-10), fingers (0-10), tally marks (0-10), ten frames (0-20), base ten blocks (11-20), ten and _ more (11-20), and 10 + _ (11-20). Four optional recording sheets are included. 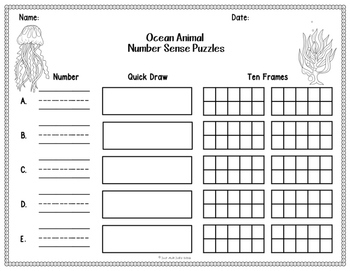 Two are to be used with numbers 0-10 and the other two with numbers 11-20. 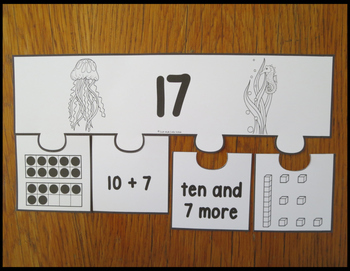 You select the range of numbers to meet your students’ instructional needs. 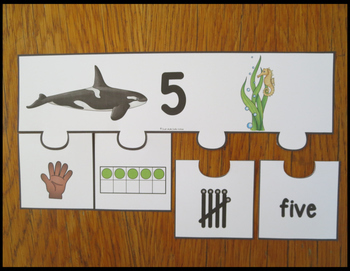 This activity is ideal for either resource or intervention groups or as an independent math station. ★Look for the green star next to my store logo and click it to become a follower. You will now receive email updates about new products and discounts. Please provide constructive feedback for this product. My goal is to create quality instructional products that you are able to use in your classroom. •Please go to your My Purchases page. Beside each purchase you'll see a Provide Feedback button. Simply click it and you will be taken to a page where you can give a quick rating and leave a short comment for the product. Each time you give feedback, TPT gives you feedback credits that you use to lower the cost of your future purchases.